“The Hundred Story House” is a new collaborative public art project that I built with Julia Marchesi. I met Julia around this time last year. 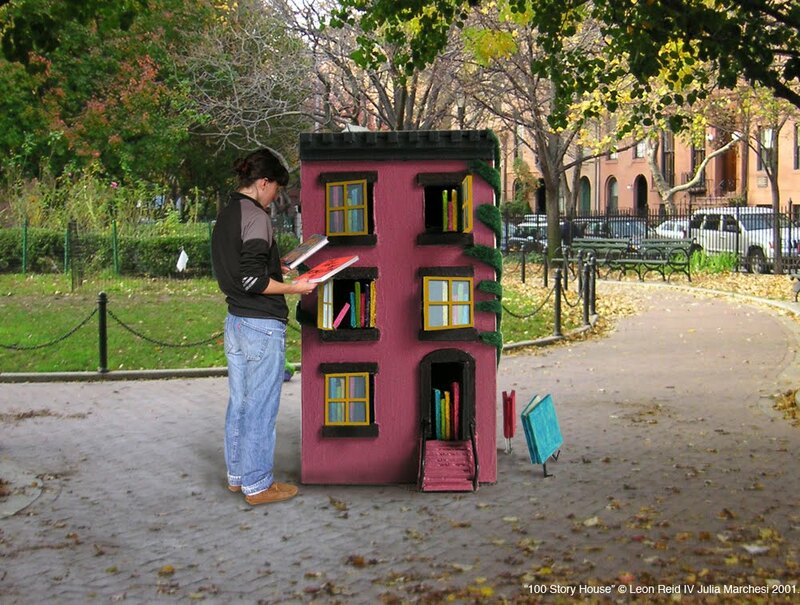 She wanted to create a public art project that would serve as a repository for housing the stray books often found on stoops and sidewalks across Cobble Hill and other parts of Brooklyn. She envisioned that the project would be located in Cobble Hill Park, partly because she lives in the area but also because of the volume of abandoned books there and the neighborhood’s strong literary tradition. At our first meeting, Julia pulled out a tiny crumpled news clipping of a similar project in Berlin, where a tree stump was carved out to contain cubbyholes where books could be stored and exchanged. I took a look at the news clipping and immediately thought: This is a great idea, and I can do better than a tree stump. For a year we tossed ideas back and forth about what form the receptacle should take and what role it should play in the community. 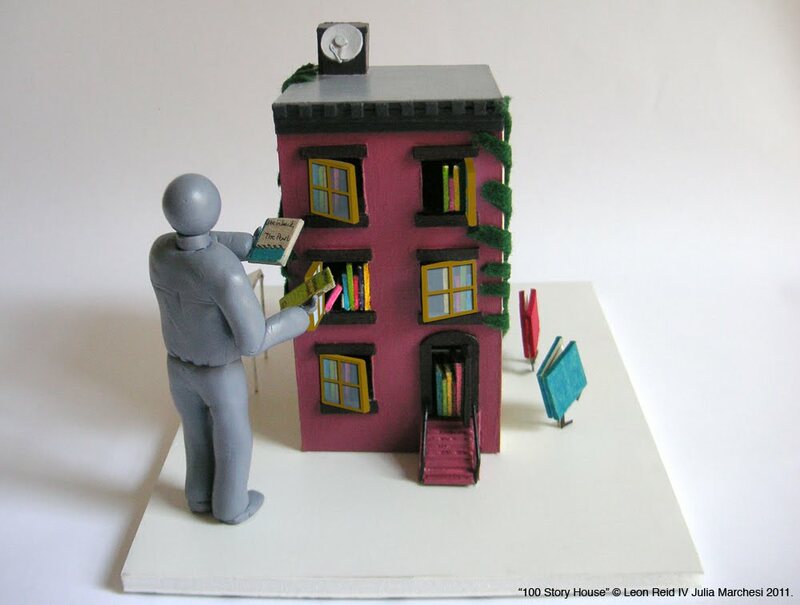 We settled on a brownstone house, because brownstone is the most distinct architectural feature of Brooklyn and homeless books needed a warm place to stay, so-to-speak, before taking up residence again on somebody’s bookshelf. I looked at it as a halfway house for stories or “the pound” for novels. The project’s title refers to its capacity to absorb 100 books at a time. We agreed that the House should not be isolated to the confines of Cobble Hill, and if resources and positive feedback were there, we could move it to other parks across the borough and perhaps around New York City and other U.S. cities. We hope that the House will provide people with not just a unique reading experience, but also an opportunity to exercise a tenet of American democracy: the free exchange of information — in this case powered by public art. We hope that communities such as Cobble Hill (and many more) will be drawn closer together through this vehicle of exchange. If only two people strike up a conversation as a result of the House, then Julia and I can define success. Julia Marchesi is a Brooklyn-based documentary film producer. She most recently produced and directed an hour of the ten-part series “Finding Your Roots” with Henry Louis Gates, Jr. Credits: Photos courtesy of Leon Reid IV. this sounds like a fantastically creative service to the community. i hope to see it in a nearby park some day! How Should Architects Approach Urban Informality?